E-bikes are on the rise. As a mode of transportation, they have the benefits of a bike (no insurance fees, low operating costs, no parking costs, no emissions, exercise, minuscule energy usage) plus you can arrive faster with heavier loads and not drenched in sweat. E-bikes present great potential to our health and the environment. And for tall people, the greatest plus of all, a mode of transportation with unlimited head room! Also, and this applies to my current predicament, it’s a way to keep on a bike despite injuries. I’m simply not willing to give up biking! 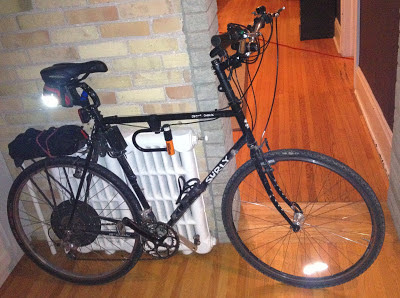 There is another solution however, and that is the E-bike kit coupled with an existing tall bike. And there are a great deal of E-bike kits around, even overwhelmingly so. After doing my research, it became clear that the BionX system is the most complete, proven, and well known system. It’s quiet, has the best torque sensor for pedal assist (motor is powered relative to pedaling power) on the market where the torque sensor is designed right into the motor hub, arguably the best regenerative braking system, and is the lightest system in its class. But… the system is proprietary and expensive. As others have hypothesized, If Apple designed an E-bike kit, it would be very much like this. The cheapest comes in around $1100 while the most expensive at $2000. The more expensive kits have more power and go further. Though it’s obvious that the more powerful systems are more expensive due to larger batteries and more motor windings etc., the price increase is exaggerated. This just happens to be the price structure BionX chose to best profit from the variety of potential customer’s desires and pocket books. That’s business. 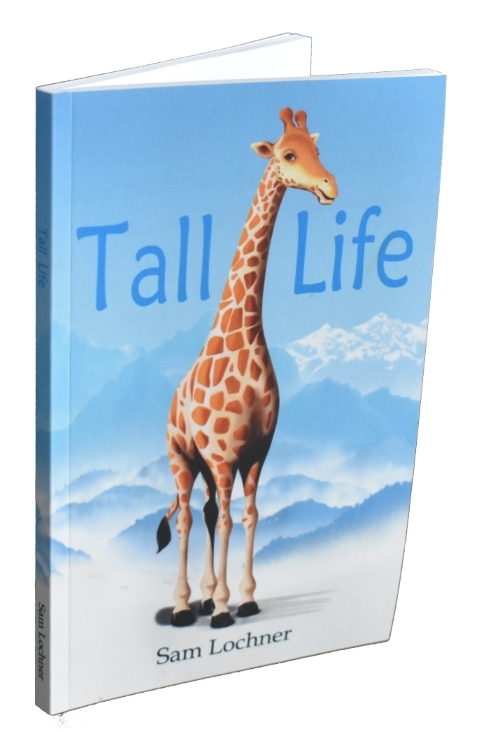 But it’s also bad news for tall people who are heavy and aerodynamically challenged. My test ride of a top of the line BionX system went fine on the flats, but even the slightest hill left me crawling along. And that was on a tiny aluminum bike with no luggage. An entry level system wouldn’t do much for me on my fully loaded tall bike on a hill. Direct drive motor rather than geared because I wanted it to be quiet, be able to regenerate the battery while braking, and have minimal moving parts so it lasts longer. Other parts include a half grip twist throttle, a nine speed freewheel (needed spacers to make it fit), a three-way auxiliary switch to change between power settings, brake levers with built in motor cutoff/regenerative braking switches, and 13 gauge spokes. 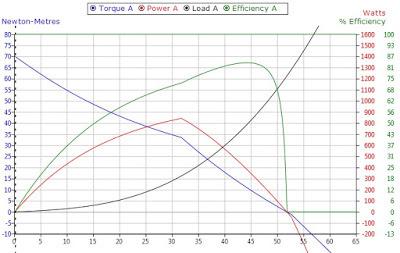 ebikes.ca provides a simulator that calculates the maximum torque output of my system to be 70 Newton-Meters, nearly double that of the top of the line BionX system for a fraction the cost. E-bike break levers and throttles are designed for flat rather than drop bars. So I had to put flat bars on the bike, which shortened the cockpit. Switching bars also meant I had to switch shifters. It would have made more sense to start off with a 29er mountain bike in the first place. The E-bike brake levers I got from Grin Cyclery had too little mechanical advantage for the short pull length of standard cantilever breaks, so I swapped them for some Deore V-brakes. This made a lot of sense anyway, as the V-brakes do a much better job braking, which is crucial for a heavy E-bike. 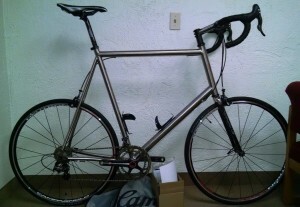 That being said, disc brakes would be even better. 10ah hours wasn’t quite enough. I was only getting about 30km running at 500 Watts on fairly level ground with minimal pedaling. So I upgraded to a 15ah battery. I bought a torque arm to take some of the load off the drop outs and prevent spin out. However, I had trouble getting it to fit, so I have been riding without it. I’ve run up to 800W without a problem. The fast and heavy setup makes for a bumpy ride. Some people might prefer full suspension or at least a front suspension fork for such a setup. For me, I installed a Thudbuster suspension seat post (see affiliate image link below) and that seems to be doing the trick OK. Also, I plan to put a 40mm tire (up from 32mm) on the front to match the back. Despite the thicker than standard spokes, I keep breaking them and the wheel keeps going out of true. This probably has something to do with it being the first wheel I have built, but also because it’s a really heavy setup. I’m going to rebuild the wheel, but this time with washers to distribute the load on the spoke heads. 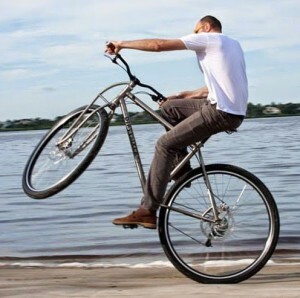 In the end, the tall e-bike turned out absolutely brilliant! 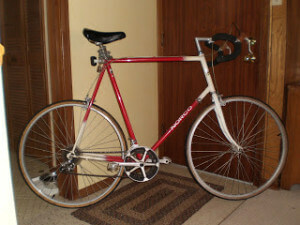 What is important is to know how someone can obtain such bike? Nothing else and this information is missing!! 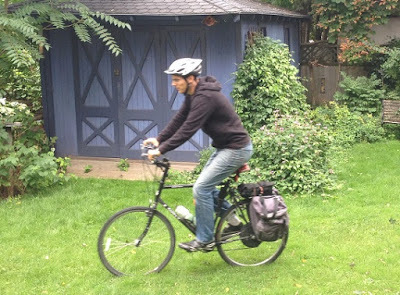 I am seriously thinking about building an e-bike based on the 500 w BionX system and 52 cm Surley Cross Check frame. Your comment about the BionX system being poor at climbing hills worries me. 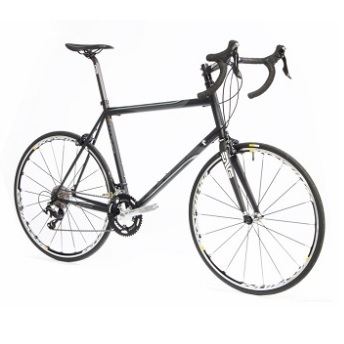 I live in hilly country and usually ride 20 – 50 miles per ride. I do not care about speed but do want some significant boost on hills so that I don’t have to subject my knees and hips to too much pressure. I am getting old and my body does not handle such stresses very well — hence, my interest in an ebike. If you wan’t help on the hills, then direct drive probably isn’t the way to go. Something like a mid-drive would be better. Thank you. Others have indicated that mid-drives are better for hills, also. However, no one has said why that is so. The mechanical advantage of a hub motor is set by the diameter of the wheel and cannot be changed, even when it would be advantageous to increase the mechanical advantage such as on a hill. A mid-drive motor, on the other hand, uses the bicycles gearing system. So when you shift down to first gear, the motor spins more times per wheel rotation, thereby resulting in greater mechanical advantage. This is critical for hill climbing where you are working against gravity.